John Jeffries' own copy of his historic narrative recording the first international aerial voyage across the English Channel. A Narrative of the Two Aerial Voyages of Doctor Jeffries with Mons. Blanchard; with Meteorological Observations and remarks. / First Voyage, on the Thirtieth of November, 1784, from the Rhedarium, near Grosvenor Square, London, into the Paris of Stone, in the Country of Kent; in performing which, we were suspended, and floating in the Atmosphere, on Hour and twenty-one Minutes. / Second Voyage, on the Seventh of January, 1785, from the Cliffs of Dover, Near the Royal Castle, across the British Channel, into the Forest of Guines, in the Province of Artois, in France: In completing which, we were suspended, and floating in the Atmosphere, Two Hours over the Sea; and forty-seven minutes of the Land of France. Jeffries was a wealthy American physician and, having caught the ballooning fever, financed the expedition himself - in the process turning Blanchard into the first professional aeronaut. Blanchard's first successful balloon flights had occurred only one year before, but in these infant stages of ballooning history, he was considered highly experienced. After the first trial flight, Blanchard agreed to take Jeffries across the channel. Blanchard must have been doubtful that the balloon could handle two people, for they carried only 30lbs lf ballast and he would only take flight on the venture after accepting an oath from Jeffries that he would jump out if necessary. Blanchard proved correct and the balloon never attained a safe altitude, but by jettisoning everything possible, from the steering gear to their coats and trousers, two two made it across the channel, landing, as it were, in little more than their smallclothes. The French erected a monument at their landing point - which is pictured in an engraving at the back of this volume, opposite the final text page. The venture was a resounding success and marked a pivotal moment in this history of aviation. Jeffries, being a man of both means and leisure, composed a sixty page narrative describing the accomplishments in detail. The narrative consisted of a stipple-engraved portrait frontispiece by Caroline Watson after F. Russel, and an engraved plate illustrating a column to commemorate the event. Jeffries printed the volume at his own expense. 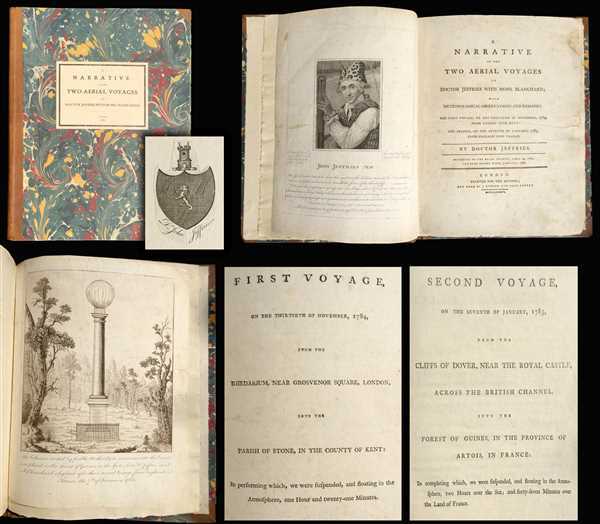 It must have enjoyed a very limited print run with no commercial element, as almost all known copies are directly related to either individuals related to the voyage, their families, or dignitaries. For example, known copies bear plates from the library of Camille Blanchard (descendent of Blanchard), Benjamin Joy Jeffries (Jeffries' Grandson), George Washington, Phillip Carrigain (another doctor and friend of Jeffries), etc. The present example bears the unique distinction of being Jeffries own copy, featuring a bookplate bearing his armorial crest and name. The volume is a small folio in a modern period-style binding, leather spine, and marbled boards. This work exists in only one edition. Very rare. Very Good. Printed for the author and sold [by J.Robson], London, 1786. Engravings (illustrator). First Edition. 11.25 x 9 inches. Complete including: Jeffries' bookplate, frontis engraving, title page for two volume set, title page of first narrative, title page of second narrative, the 'advertisement,' 60 pages of text, and the endpiece engraving. Light soling and foxing throughout but generally clean and consistent.